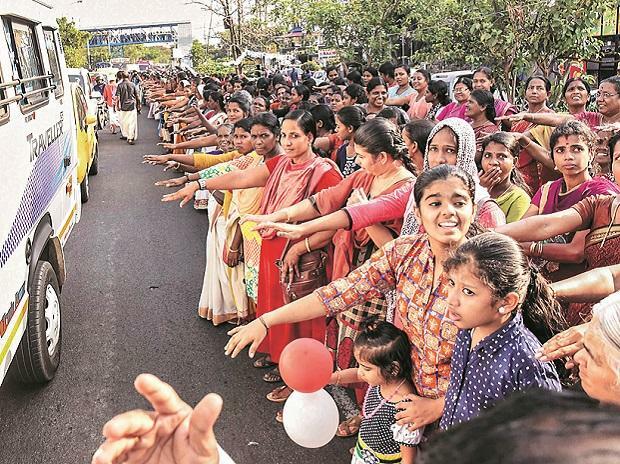 In a first, millions of women stood should-to-shoulder across the national highways, creating a 620-km-long human “wall” from the northern end of Kasaragod to the southern tip here on Tuesday as part of a state-sponsored initiative to uphold gender equality. The event comes days after thousands of devotees lit “Ayyappa Jyothies” (lighting of sacred lamps) and lined up from Hosangadi in Kasargod to Kanyakumari, vowing to protect the age-old customs and traditions of Sabarimala. On Tuesday, women from various walks of life —writers, athletes, actors, politicians and techies, government officials and homemakers — stood across the highways crisscrossing through the 14 districts in the state as the event commenced at 4 pm. Expressing solidarity, thousands of men also lined up parallel forming a second human “wall”. The event is part of an initiative to protect secular values, gender equality and to spread a message against those trying to push society into the dark ages, organisers of the programme said. Before the formal start of the event, CM Pinarayi Vijayan garlanded the statue of social reformer “Ayyankali”. CPI(M) politburo member Brinda Karat and CPI leader Annie Raja also paid floral tributes at the statue. Vijayan had earlier expressed confidence that women, cutting across lines of caste and religion, would join the “wall” to save Kerala from being “dragged back into the era of darkness.” CPI(M) state secretary Kodiyeri Balakrishnan had earlier said that 50 lakh women were expected to take part in the event. Health minister K K Shylaja led the 'Women's Wall' at Kasaragod and Karat was the last person at the end at Vellayambalam here. School students were given half-day holiday, while universities postponed exams scheduled for Tuesday. The government employees and Technopark employees were allegedly asked to take part in the event, which the main opposition Congress-led UDF dubbed "caste wall" and "wall of contradictions". The participants began lining up at the designated centres since 3 pm. A rehearsal was also held.